This group of seafront apartments on the site of the former Bournemouth International Hotel is perched right on the cliff side. 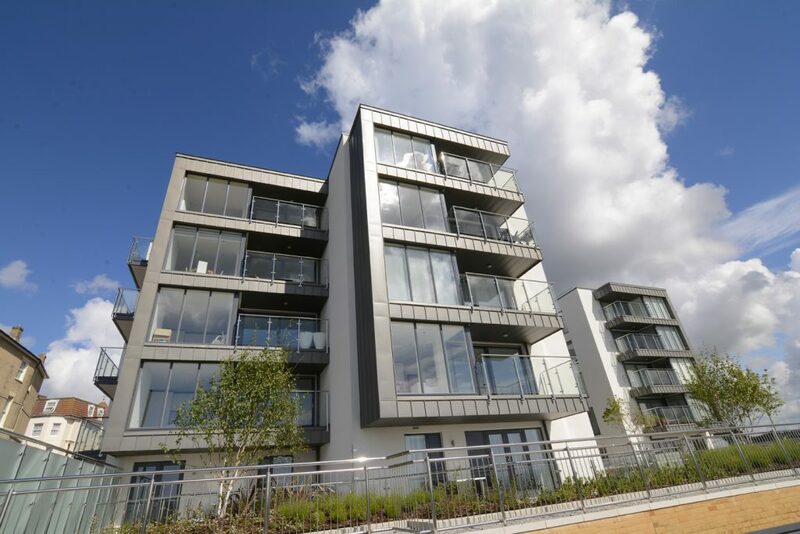 The modern aesthetic of white render and glazed balconies is offset with crisp elZinc zinc cladding supplied by SIG Zinc and Copper and installed by the specialist cladding team at ICEE. The project for Taylor Wimpey Southern Counties was designed post-planning and managed on site by architects WADP. 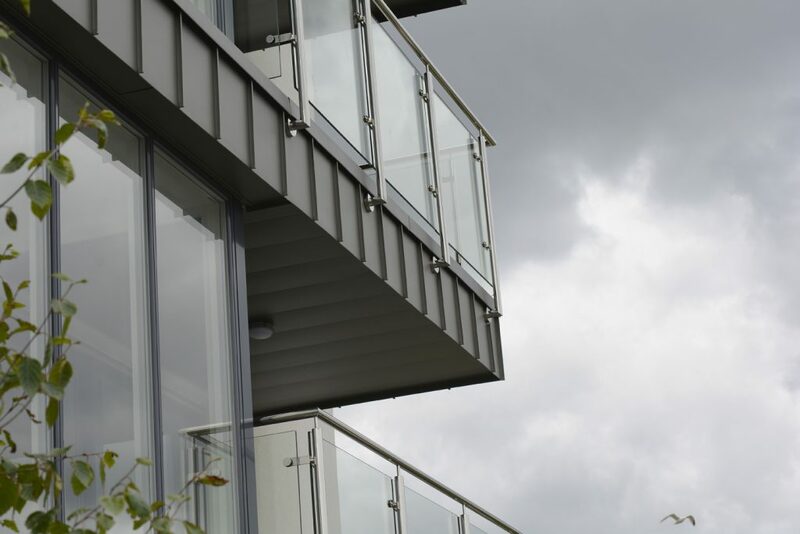 Metal is an increasingly popular material for use in roofing and cladding in the UK, and this isn’t surprising when one sees the beautiful precise lines of the material, and understands the longevity and almost zero maintenance of metal products. 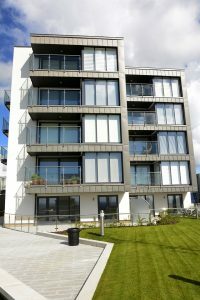 The materials are also very popular in projects at coastal locations, although as we have written before, you need to know what you’re doing using metals in environments exposed to marine winds and salt spray. “The biggest challenge on this site was the extreme marine environment,” says Jonathan Tolley, Architect at WADP, “This scheme really is exposed to the elements. It’s on top of a cliff; there is literally nothing between it and the sea.” Any materials had to survive that environment and be resistant to staining of any salts on the surface and self-cleansing. The was a suitable challenge for SIG Zinc and Copper, who provide a wide range of metal products for roofing and cladding. The new development of luxury flats known as ‘Coast’, is the first use of elZinc Slate Advance in the UK. Specifically designed to be used in marine environments, elZinc Slate Advance has a protective coating which provides a barrier to salt damage and allows the salt to be washed off so it cannot eat into the metal. Jonathan Tolley became involved in the project after planning and took it to completion as architect. As Taylor Wimpey had secured planning permission with a combination of white render and zinc cladding, one of Jonathan’s first tasks was to find the appropriate material. The design team looked at a wide range of products. 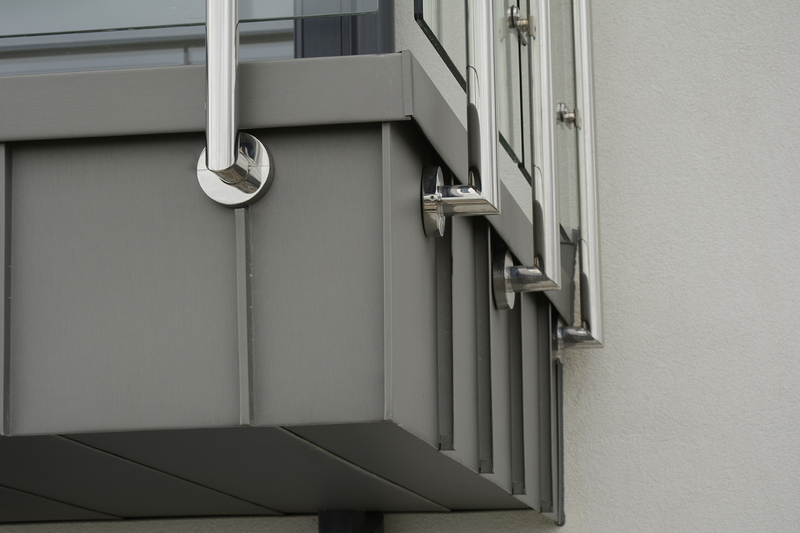 Whilst the main driver was to maintain the look of zinc, the product also had to perform, and elZinc Advance promised the ability to survive this harsh environment over the long term with minimal maintenance. However, the choice of product was only part of the client’s decision. It was also essential that supplier and installer could provide the right level of technical support. SIG Zinc and Copper don’t just supply the material; their service includes impartial product selection, design and detailing and full support throughout the contract. They and their accredited installers ICEE attended regular site meetings and made up example panels to demonstrate alternative details. The project went smoothly and WADP are now about to begin another, larger project with Taylor Wimpey. They will be using elZinc Slate Advance again, although in a less harsh environment. 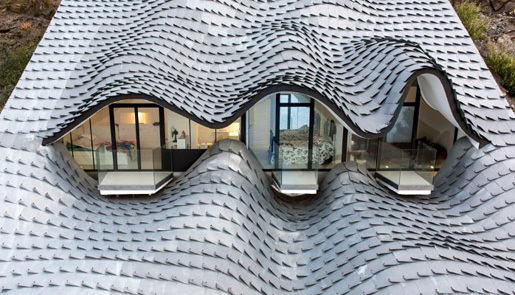 His advice for architects is simple – if you can use Zinc it’s an excellent material with many advantages. elZinc Slate Advance is a pre-weathered zinc with a coating that makes it suitable for use in coastal environments. The Advance coating is also available on our full range of coloured elZinc products, which makes them all suitable for use in a coastal environment. If you’d like to discuss the range of different zinc products available and what might be suitable for your project, do get in touch.